Want a well appointed and cozy home for your next getaway with beautiful sunrises and sunsets, nature calling (eagle nest or Osprey near the end of the pier)and a place to enjoy yourself? This is the place. 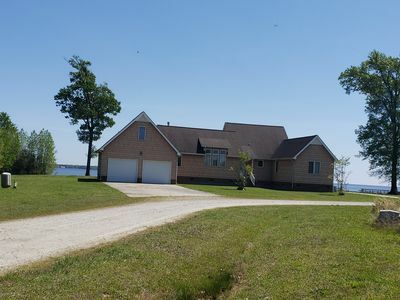 No fighting the traffic or crowds, this lovely home is located on Holiday Island, a small residential community on the Albemarle Sound, 15 minutes away from the main roadway (Route 17 or also known as Ocean Highway). 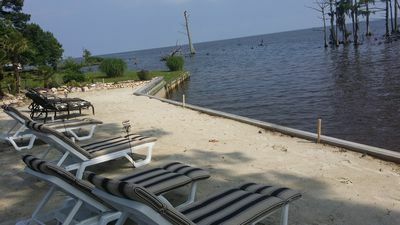 Located 30 minutes from Edenton and 30 minutes from Elizabeth City. 60-90 minutes from Virginia Beach, Norfolk, Chesapeake (lots of military bases and museums) and the Outer Banks . There are many small towns close by to visit and explore. 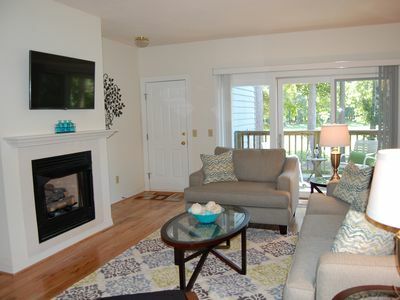 The home has a fully equipped kitchen and sleeps 7 comfortably. The home has been completely renovated and updated. The outside space of the home continuously gets changed with new features. and now is being updated with a new 10 foot by 20 foot deck right up to the water edge along with raising the first part of the pier and extending the beach approximately another 30 -40 feet. There is a 50' flat screen in the great room. Cable TV Wireless internet is provided. Pandora and Netflix are already on the TV sets. The downstairs bedroom has a queen bed in the master bedroom with a TV. All the bedrooms have wonderful mattresses. One full bath also located downstairs. One upstairs bedroom has a queen bed. The other upstairs bedroom has a twin over full bunk bed. There is one bathroom upstairs with a beautiful remodeled walk in shower. All linens and towels are provided. We do not supply beach towels. Please do not use the bath towels for beach towels. Complimentary coffee, tea, sugar, creamer and a huge variety of spices are in the cupboard along with some paper towels and toilet paper to tide you over until you get to the store. You can bring some firewood because there is a fire pit next to the beach and a picnic table right in the side yard to have lunch or a snack. There are beautiful views from the sun room overlooking the water (just 50 feet away). Enjoy the wonderful southern breeze coming from over the water on the pier while watching the pair of eagles, hawks, egrets and on rare occasions, dolphins. The children will enjoy using the cove, picking up clams or crabs off of its sandy bottom. There is a crab pot provided and they can enjoy kayaking in the shallow cove. For the more adventurous, there are many canals, and you can spend a few hours exploring them in the kayaks. There are nine freshwater rivers that feed into this sound making it a great place to fish. So a boat would be really nice to have. The ramp is located in the community center about 3 minutes away. Fishing in the canals or out in the sound, you can catch catfish, flounder, croaker, large mouth bass, striped rockfish (striped bass), white perch, crappie, trout, speckled trout, puppy or slot drum (redfish), gray trout, spadefish, sheapshead, tautogs, bluefish, spanish mackerel. Anyone that has fished here has said that fishing was great. There are also beach chairs, umbrellas, corn hole boards, floats, life jackets, swim floats, paddles for the kayaks and fishing rod holder for the brown kayak and a stereo for music outside of the house all located in renters shed. A quick note and warning. When you are playing music, keep in mind that there is a new noise ordnance that was just issued in 2017 that limits noise to no more than 50 feet past the property line throughout the county. That includes playing music, singing, shouting, fighting or creating noise through loud or boisterous speech audible off premises. Parents can be help accountable for violations. The same applies to the neighbors. The sheriff (252 426 5615) is responsible for enforcing the new ordinance and carries anything from a warning, $100 fine or 30 days in jail. 6 kayaks for your use while visiting. 4 bicycles and a child's bike. We are hoping to put a new 14x 30 foot pool in 2018. My wife has opened up an Art and Music Studio on the island called Rose Gate Studio for the Arts and a satellite studio in downtown Hertford. The one on the island is located in the clubhouse on Holiday Island. If you are interested in doing some “one on one” art lessons, art projects with your family and friends or just music lessons, give us a call ahead of time. There are multiple instruments: Baby grand piano, guitar, harp, hammered dulcimer and banjo in the studio. Just call before and let us know when you plan to be down and what it is you would like to do and we will try to accommodate you. The website is RoseGateStudio.weebly.com. Yoga classes/instruction are also available. Freshly roasted coffee is available by request and can be delivered. Edenton Coffee House at 302 S. Broad Street Edenton 252 482 7465 is similar to Starbucks. Only sells organic and free trade coffee, espressos, smoothies, teas, pastries, desserts, breakfast and lunch with live music on Fridays from 7-9PM. Large park with a huge covered area with swings for the children and a place to jump off of the side of the bulkhead into the water along with a large field and a basket ball hoop. Tennis court are also located in downtown Hertford. You can play golf on a PGA golf course at the Albemarle Plantation that is next door to Holiday Island. A PGA tournament was played there in 2014 and 2015. It is a private Golf and Marina Club, However the public is welcome to dine in their fabulous clubhouse and grill. There are many 'mom and pops' stores and restaurants around here and we have included a list of them in the email attachment that you will receive when you book this home. There are also a lot of the franchise restaurants and stores too. There are also Kayak tours in Edenton along with running and bicycle marathons. Edenton hosts yearly house tours of the historic district homes. Fourth of July Fireworks are absolutely awesome as you sit at the water's edge. We have a boat on site until the other lift is operational that is located on another piece of property a block away. We enjoy taking people out on boat rides and you are more than welcome to take one with us. We have just listed a few of the things to do here in the area. There is so much more to do. We provide a handout that is emailed to you when you book with a list of additional things to do. We also have card games and board games here too. We do not have any game consoles.